Cooperative Virtual Machine can run Virtual Machine without the need of Virtualization. Cooperative Linux is such an example of Cooperative Virtual Machine (CVM). Previously we published an Guide on How to Run Linux on Windows PC Without Virtualization Support, but we have not discussed the theoretical aspect of Cooperative Virtual Machine. Advantage of this approach is to achieve a good performance with relatively less development time. The disadvantage is that, instabilities and vulnerabilities of the guest system to the host system. In case of crashes on traditional virtualization solution, from the host system it can be stopped and restarted. A Cooperative Virtual Machine can also crash the host system. Because of its deep integration in the host system Cooperative Virtual Machine run with administrator privileges and has also the probability of malicious softwares in the guest to get full access to the host system. 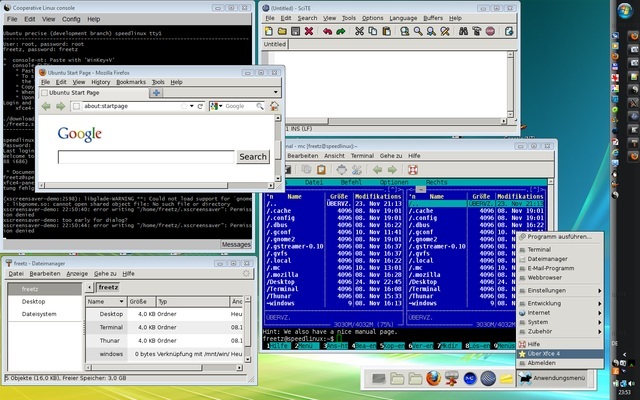 Among Cooperative Virtual Machine, coLinux is mainly for Windows and Linux is designed to allocate memory. Cooperative Virtual Machine has no access to the physical hardware and works with a virtual hardware abstraction layer , the hardware access is mapped by Windows in case of coLinux. But it is a wrong idea that Cooperative Virtual Machine can not use multiple processor cores. Although most Linux version of Cooperative Virtual Machine usually uses only one core, there are research level works to enable usage of multiple cores. A division of Cooperative Virtual Machine, coLinux is available as Windows Installer. It includes a virtual network card and a modified Linux kernel. For proper operation it includes a hard disk image, X-Server for Windows is bundled, such as Xming . coLinux provides an opportunity to work with Linux without repartitioning the hard drive. Cite this article as: Abhishek Ghosh, "Cooperative Virtual Machine : VM without Virtualization," in The Customize Windows, September 10, 2012, April 25, 2019, https://thecustomizewindows.com/2012/09/cooperative-virtual-machine-vm-without-virtualization/.